This little gizmo will create a ramp or gradient from the top part of a character to the lowest part, this is useful if you want to color-correct it but you want to use only the length of the character. we only want a gradient from the top to the bottom of the geko. This gizmo uses the metadata from the exr to calculate the ramp, is pretty simple and can be customized to do more things. most of the options are pretty self-explanatory, just play with the values. Aug 3, 2018 VelocityBlender noise reduction technique. Mar 6, 2017 Easy frame checker for Nuke. Nov 2, 2016 métodos básicos en Nuke. Dec 6, 2015 Nuke VectorBlur.. añadiendo desenfoque de movimiento en post. One of the biggest problems with CG is the noise, it takes a lot of CPU power to render an animation without it, and sometimes is not possible to get rid of it without going to insane long render times. In 2014 at the beginning of the King Julien show we had this problem, one solution I used to do when I was a painter is blend frames in the patches so it looks smooth. With Jordan Cho, a great comp and vfx artist we figure out that if the velocity is used to mask the frame blending in a CG character we can reduce the noise of it. "Then the logic was if the character is not moving much the blending will be more effective, as soon begin to move the motion blur will make the noise imperceptible." Since latest version of Nuke has already this feature and we found out that our tool in the Internet and also being used in some studios I think is right to give credit to the people behind it. For the next 3 years Jordan and me fine-tune this tool, so it can reduce a lot of the noise in any pass, have customs mask and exclusions for props that don't need blend or generates ghosting, have triple blending to get rid of complicaded character noise. At the end to make the thing easier for the artist, there is tree setups. action, talking, staying still. But also there where custom version tailored for different shows. Different setting for the action of the characters. 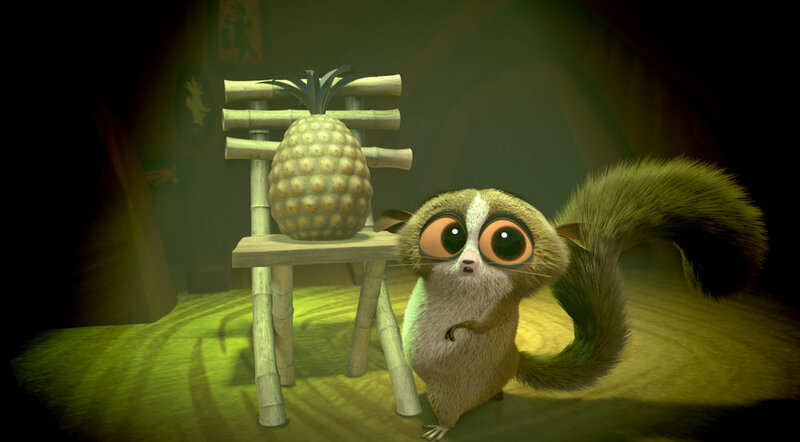 Velocityblender was used in a series of projects like King Julien, Puss and Boots and become one of the main tool in the studio, I know that Technicolor used too in their productions. All images and characters belong to DreamWorks, I'm using it as demonstrative purposes. Control lights is one of the most important thing to do when you light a scene, but also if you separate each light in a different pass or render element is very useful to comp it later and tweak anything without re-rendering all again. To address this in Vray, we can render each light as separate pass, we need to create an render layer and add the lights and set, geometry, etc. create a new render layer. As example I have a simple scene that I added five lights. There is a manual way to do this, assigning each light to a render element and link it, but it takes a lot of time and if you have a bunch of scenes to light, the practical way is to do it with a script. This small script will do the job, you need to place in the render layer (this example city_SET) and add all the lights, run the script, if you need the specular pass there is that option too. From here we can comp in Nuke and add any light effect, color. Using the light passes to give some mood and color to the scene . This way we make candles, torches, interiors and even characters, and have key lights, fill, rims, etc.. Is a better way to iluminate and has the flexibility to make changes in comp later. There is a tutorial for doing this in 3DsMax here. Easy frame checker for Nuke.